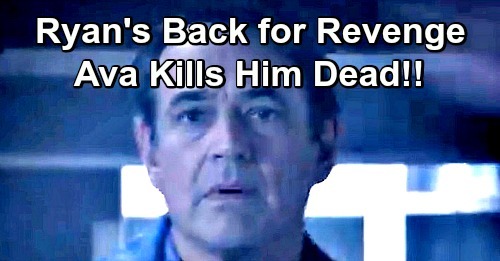 General Hospital Spoilers: Ryan Back for Final Revenge, Takes Over Kevin’s Life Again – Ava’s Deadly Wrath Derails Plan? General Hospital (GH) spoilers tease that Ryan Chamberlain (Jon Lindstrom) may make his devious return this week. Will he once again gain the upper hand and impersonate Dr. Kevin Collins (Jon Lindstrom)? GH’s latest promo shows Kevin walking through a dimly lit room as a fist emerges from the shadows to strike. Kevin takes a hard punch to the head and seemingly gets knocked out. Naturally, that’s led to speculation that Ryan himself may deliver the blow. After all, no body was found, which usually means the dead aren’t really dead on a soap. The promo also features several Port Charles residents looking over their shoulders nervously. Lulu Falconeri (Emme Rylan) and Dr. Griffin Munro (Matt Cohen) are among that group. They were targeted by Ryan, so they’d be wise to watch their backs! General Hospital fans will recall that Ryan told Ava Jerome (Maura West) about a cabin just over the Canadian border. He suggested they could hide out there until the search died down and it was safe to move on. Perhaps that’s where Ryan’s been staying since that footbridge jump. Jason Morgan (Steve Burton) was busy saving Ava after Ryan tried to take them both to their deaths. Laura Webber (Genie Francis) was also focused on Ava in that moment, so Ryan might’ve grabbed the underside of the bridge and secretly made his way to the other side. Then again, maybe Ryan was just tough enough to survive the icy waters below. That’s not that much of a stretch in the soap world. Regardless, Ryan might’ve made his way to that cabin he mentioned and treated his own bullet wound. After a little recovery time, Ryan may be ready to reunite with Ava in PC and get his final revenge on Kevin. Of course, Ava is feeling awfully vengeful as well! She just might pose a bigger threat to Ryan than he realizes. Will Ryan’s next deadly impersonation plot be derailed? Will Ava catch on quickly and kill Ryan just like she wanted? General Hospital spoilers say some hot drama’s ahead. We’ll give you updates as other GH news comes in. Stay tuned to the ABC soap and don’t forget to check CDL often for the latest General Hospital spoilers, updates and news.